The ancient gods would have loved Benoît Jacquot’s 3 Hearts, a romance that’s all fate and no free will, with characters who are mere pawns in this hopeless game called life and nothing more than slaves to the universe’s cruel timing. Hyperbolic? 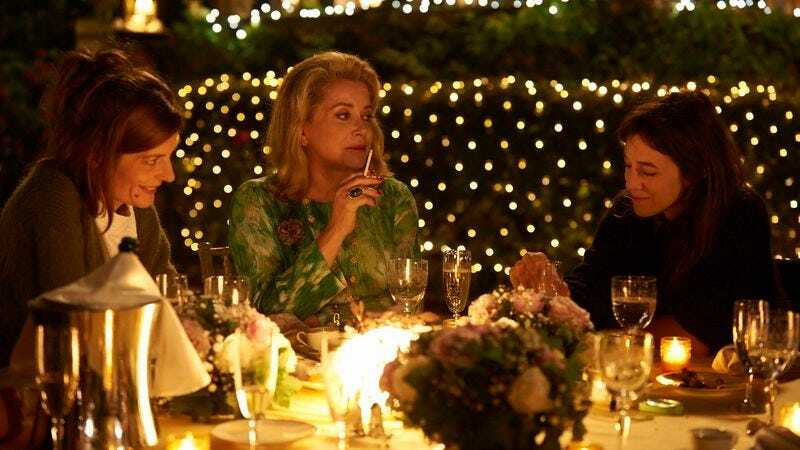 Perhaps, but Jacquot’s follow-up to the coyly closeted costume drama Farewell, My Queen is hardly a work of subtlety: Two sisters fall for the same man, sexual desires are repressed, emotions eventually explode. But while the controlling deities might have found some amusement in this narrative, in Jacquot’s hands the tale is more bland than tragic. Marc (Benoît Poelvoorde), a tax inspector with a weak heart (so begins the subtlety), is stranded in the banlieues of Paris when he misses the last train home. After wandering into a café, he sees Sylvie (Charlotte Gainsbourg) and asks where he can find a hotel. The two are stricken with a combination of lust and love, and decide to meet a week later in a park in Paris. But Marc’s heart fails him, and after an anxiety attack he misses their meeting. Thinking all love it lost, Sylvie goes back to her boyfriend and makes a move to Minneapolis. (The cruelest of all fates.) A short time after, Sylvie’s sister Sophie (Chiara Mastroianni) happens to meet a kindly taxman—and lo and behold, it’s Marc. Away in the U.S., Sylvie doesn’t know whom her sister is seeing, as Marc is constantly out of the house when the sisters are Skyping. Eventually, the ill-fated lovers discover the trick Cupid played on them and vow to never tell Sophie. But, being mere mortals, they can’t control a thing. Though a love triangle scenario is hardly new territory, Jacquot strikes an intriguing tone in the outset, employing a score that’s more suited to a thriller. Over the credits, strings throb and pulse, generating an impending sense of tragedy. Riffing on this refrain throughout, these foreboding sounds become the soundtrack for Marc and Sylvie’s bad romance. 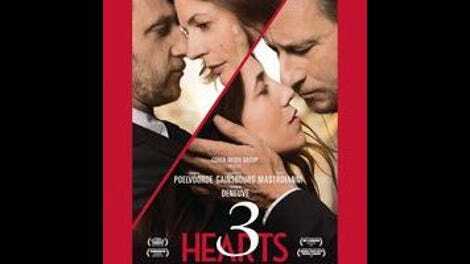 The scoring frames 3 Hearts’ vision of love as something of an antidote to sickly sweet romances. But then, its own doomed take isn’t all that complex either; it’s nothing more than a rumination on shoulda, coulda, woulda. The gloom feels unearned. Even the stacked cast leaves something to be desired. Gainsbourg and Mastroianni are, as always, mesmerizing to watch, and they bring some depth to the otherwise archetypal binary sister set-up. But given their most recent past works are the penultimate in suffering (Nymphomaniac and Bastards, respectively), the actresses’ rendering of emotional turmoil here seems phoned in. All the movie’s heart is in its title alone.